Kym Nelson’s second-half strike settled victory for Glentoran as Portadown suffered a second successive defeat and ended the afternoon with 10 men. Glentoran’s share of possession increased as play progressed but the Ports forced the best save of the first half. A clever sliderule pass by Sam Simpson released Mark McAllister, with the Ports striker pushed wide but his pass deflected across the edge of the area towards the supporting Stephen Hughes after the half-hour mark. Hughes’ drive from outside the area appeared on course for the inside upright but Elliott Morris produced a diving save to push the shot wide of the target. The Glens entered half-time having clocked up a double-figure tally of free-kicks but without a cutting edge. Ross Redman, on his return to hometown club Portadown, linked up with Curtis Allen on the left-hand side of the box early on but the latter’s shot cleared the crossbar. Aaron Smyth enjoyed plenty of time and space down the right wing, with Jonathon Smith also sharp along the visitors’ frontline. Chris Lavery’s looping header drifted just past the target as Glentoran pushed for an opening across the initial stages. However, Portadown also entered the interval looking back on a chance off Hughes’ flick towards the back post that Keith O’Hara just failed to steer goalwards at a stretch. Glentoran took control seven minutes into the second half when Nelson picked up possession and displayed impressive determination to drive forward under pressure before steering in a low drive beyond David Miskelly. 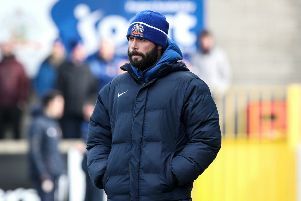 The Ports response featured clever work by Hughes to find Eoin Kirwan inside the area but his curling effort proved too high. Glentoran’s pressure increased with a Lavery drive saved by Miskelly then the winger’s cross was glanced on by Allen just beyond Nelson. Hughes came close with a late close-range shot but it bounced off the outside of the post. Portadown’s problems increased with a red card for Niall Henderson against his former club, following two bookable offences. PORTADOWN: David Miskelly, Brendan Shannon, Matthew Parker, Garry Breen, Keith O’Hara, Robert Garrett, Niall Henderson, Stephen Hughes, Mark McAllister, Sam Simpson, Eoin Kirwan. Subs: Chris McGaughey, Ken Oman, Aaron Haire (McAllister, 45 mins), Sean Mackle (Simpson, 76 mins), Mikey Withers (Kirwan, 59 mins). GLENTORAN: Elliott Morris, Aaron Smyth, Calum Birney, Jay Magee, Curtis Allen, Chris Lavery, Eric Foley, Johnny Addis, Kym Nelson, Ross Redman, Jonathon Smith. Subs: Dwayne Nelson, Ciaran Caldwell (Nelson, 83 mins), Nacho Novo (Smith, 82 mins), Steven Gordon (Redman, 88 mins), James Ferrin.